Baseball, Vietnam And Coming Of Age At The 1969 World Series On Oct. 15, 1969, hundreds of thousands marched in Washington to protest the Vietnam War. But it was also Game 4 of the World Series, and NPR's Brian Naylor, then 14, knew where he had to be. 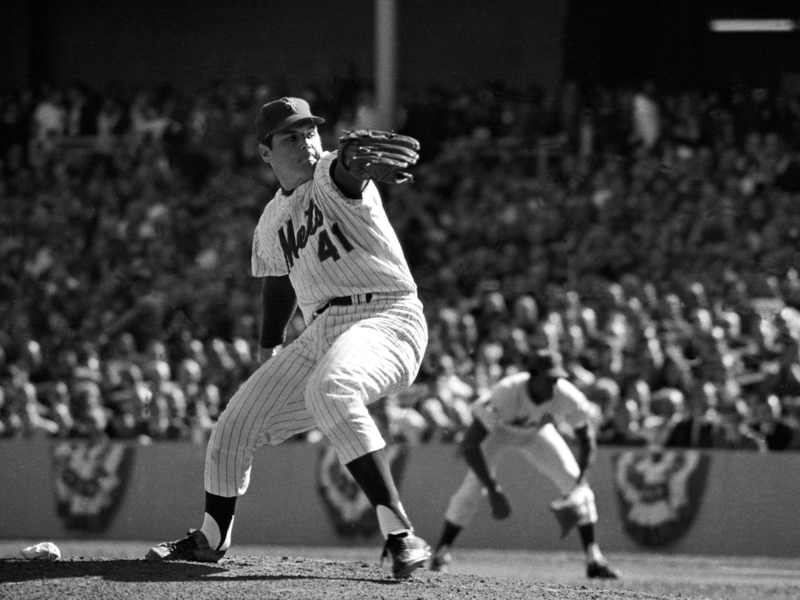 Tom Seaver of the New York Mets pitches in the fourth game of the 1969 World Series. For me, 45 years ago today — Oct. 15, 1969 — was one of those rare days, a day you remember all your life. It was Game 4 of the World Series. Mets vs. Orioles. My Mets were up two games to one. And I was at Shea Stadium. I remember it as a crisp fall day, but memories can be deceiving. I know it was "Moratorium Day," when a big protest against the Vietnam War was planned. Some of my classmates at Fox Lane High School in Bedford, N.Y., said they were planning to go. I was pretty sure I was against the war too, but at age 14 my priorities were clear: I loved baseball, I loved the Mets, and this was a chance to go the World Series. A guy who worked with my mom had gotten the tickets. We sat in the next-to-last row, way up in the upper deck overlooking right field, and perfectly positioned for what was to come. In the row behind us, a group of men sipped whiskey from bottles in paper bags. My suburban upbringing hadn't prepared me for this, but it was cool. My hero, Tom Seaver, was pitching. He had won 25 games that season and had nearly thrown a perfect game earlier that summer, and when Jimmy Qualls of the Cubs spoiled it with one out in the ninth, I had tears in my eyes. On the way into the stadium, a group calling itself Mets Fans For Peace handed out leaflets protesting the war. The cover had a picture of Seaver and a news clipping in which he called U.S. involvement in the war "perfectly ridiculous" and said if the Mets went on to win the Series, he would buy an ad in The New York Times saying, "If the Mets can win the World Series, then we can get out of Vietnam." I'm not sure if he ever bought that ad, and Seaver later said he had not been in favor of the pamphlets, and that he'd "been used." At any rate, there was a game to be played, and I remember the thrill as the Mets took the field. What a great team that was. They were called the "Miracle Mets," but in hindsight, they were a solid bunch whose success was due less to divine intervention than to playing good, inspired baseball and, well, perhaps a few lucky breaks. Mercifully, sportswriters don't nickname players anymore, at least not to the extent they did then. But back in the '60s, they gave the Mets some excellent ones. Ed Charles was "The Glider," I guess because he was so smooth. Tommie "Instant" Agee, because of his uncanny propensity for leading off games by homering. Ron Swo"t"boda. Donn "Double-N" Clendenon (OK, I made that one up). And, of course, "Tom Terrific." They were led by Gil Hodges, the beloved but stern former Brooklyn Dodger (and original Met). Of the game itself, I have one big memory, of Swoboda's full-out diving catch just below us in right field. He seemingly came from nowhere, the stakes were high, and it appeared impossible. Maybe even miraculous. It certainly saved the Mets that day. The game went to the 10th — Seaver, going all the way, holding the powerful Orioles lineup to a single run. Then, in the bottom of the inning, J.C. Martin laid down a pinch-hit bunt, and the throw to first hit him and skidded off into right field. Rod Gaspar (no nickname that I know of), who was pinch-running for Jerry Grote, scored from second — the winning run. It took another few years for the war to wind down. The guy who took me to Game 4 would become my stepfather a few years hence. But that dysfunction was for another day. I was blissfully unaware of what was going on behind the scenes at home, and not too concerned about the bigger world. I was just happy that I saw the Mets in the World Series. I've seen dozens of baseball games since then, at every level. There have been adrenaline-coursing walk-off wins and desultory, deflating losses. But so far, only one World Series game. Forty-five years later, the memory lingers. What a game it was.